Robin-sized birds weighing about 3.2 ounces. Adults are dark with light speckles on the feathers. 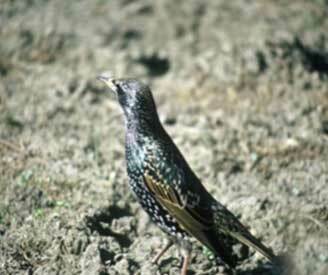 Starlings are found in a wide variety of habitats including cities, towns, farms, ranches, open woodlands, fields, and lawns. First noticed in Nebraska in 1930. Brought into the United States from Europe. They were released in New York City in 1890 and 1891 by an individual who wanted to introduce to the United States all of the birds mentioned in Shakespeare’s works. Spread by reproduction during the spring and summer. Considered pests because of the problems they cause, especially at livestock facilities and near urban roosts. They may selectively eat the high-protein supplements that are often added to livestock rations. They were recently found to damage ripening corn. Also fungal respiratory disease histoplasmosis can form in the soil beneath their nest. The disease becomes airborne in dry weather. This is usually mild but in rare cases has been known to cause blindness and/or death.